Astronomers using the PanSTARRS 1 telescope on Haleakala, Maui have observed a fast-moving object moving through the solar system, at a speed of about sixteen miles per second (1). The object's appearance is that of a point of light in the sky, rather like a star, so it is now thought to be an asteroid rather than a comet, which would have formed a coma of expunged volatile gases as it move into the vicinity of the Sun. The speed with which the object is moving is well beyond that of a regular, orbiting object in the solar system. At the distances involved, the object is moving faster than the escape velocity of the Sun, and so is now heading out of the solar system on what astronomers call a hyperbolic orbit - it's moving too fast for the Sun to have captured or retained it (2). The object has now been given the designation A/2017 U1 ('A' for asteroid, although the original designation by the Minor Planet Center labelled it as a comet: C/2017 U1 (PANSTARRS) (3)). A/2017 U1 entered our solar system from the direction of the solar apex, in the northern celestial hemisphere, then passed within Mercury’s orbit and crossed the ecliptic, achieving perihelion some 23 million miles from the Sun on 9th September. Following its perihelion passage in the southern celestial hemisphere, it crossed back through the ecliptic along its rapid outward trajectory, travelling at 27 miles per second towards the constellation Pegasus. This is supported by the direction from which A/2017 U1 came from. It originated from a point in the sky near to the star Vega, and very close to the direction the Sun itself is heading towards in interstellar space. So, this object is a bit like a gnat flying along a road directly into the windscreen of an oncoming car. This particular gnat is a reddish colour, and, according to astronomers, very likely came from another star system. Even though it originated from the general vicinity of the star Vega, it probably didn't start life there. Vega, too, is moving along its own trajectory as it circumnavigates the centre of the Milky Way galaxy, which changes its position in the sky relative to us over time. If A/2017 U1 had been ejected from the Vega system then, at its current velocity, it would have begun its journey 300,000 years ago. At that time, Vega was some distance away from where its is now. More likely, then, A/2017 U1 is simply an interstellar lump of rock of unknown origin which has, quite by chance, ended up flying through the planetary zone of the Sun. Its closest approach to the Earth was 15 million miles away, which occurred on 14th October 2017, during its outward journey away from the Sun. Astronomers were able to image the object and obtain a spectrograph of the light from it, indicating that it has a reddish hue (which may possibly indicate the presence of organic materials on its surface). 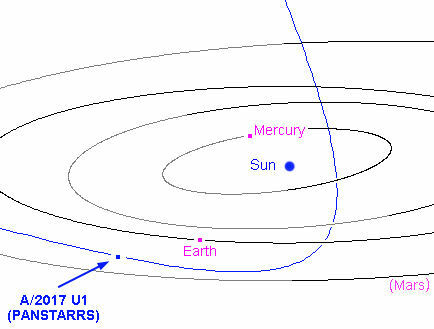 A/2017 U1 appears to have a composition similar to a typical Kuiper Belt Object, but with the added twist that it originated from another star system. Many of the known Kuiper Belt Objects are tinted red. This is thought to be due to the fierce action of solar radiation on surface, or sub-surface ices (5). Pluto has a reddish pink tint, too, displaying a diversity of surface features indicative of a complex, possibly violent, history (6). However, that itself raises the issue of why the volatiles usually associated with such a cold, distant object were not driven off by its encounter with the Sun. If the object is derived from the outer zones of any star system, then it should really have behaved more like a comet than an asteroid. The object seems to be pre-stripped of volatile ices. In which case, it must have originated from an inner part of another star system. But it cannot, by definition, be a returning solar system comet which has already had its volatiles driven away by a prior perihelion passage around the Sun. Because, if that was the case, then how can its rapid incoming, solar system-escaping velocity be explained? More likely then, this object is an ejected rocky exo-asteroid which originated from within the 'frost line' of its home star system. There is a precedent for reddish asteroids in our own system - the so-called P-type asteroids, which are a collection of dark, reddish asteroids in the outer asteroid belt which appear to have coatings of kerogen-related organic compounds. These objects indicate that some water-based surface chemistry has taken place in the past, and so they likely have some water ice contained within their interiors. So, again, with respect to this precedent, I wonder how it is that A/2017 U1 has both a reddish tint (indicating surface organics) but has not driven off its water ices during perihelion? An Emissary from Planet X? 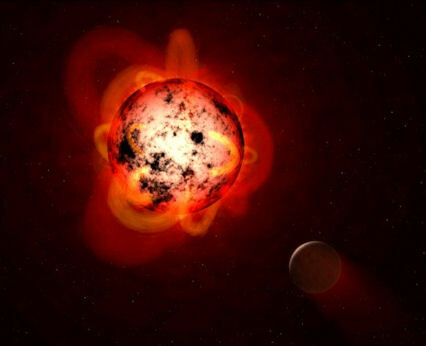 There is another possibility that has not yet been considered by astronomers. 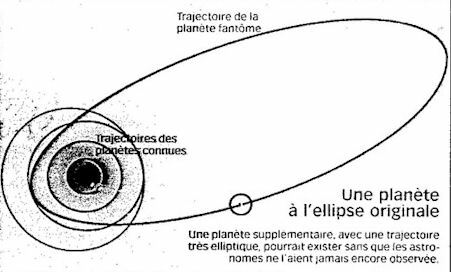 My research colleague, Al Cornette, has posted an intriguing idea on the Dark Star Planet X group. Could this object have received a slingshot from another planet in the solar system - one which astronomers have not yet spotted? My argument is that exoplanets are now routinely discovered by detecting a wobble in the parent star's position, due to the gravitational effect of the hidden planet orbiting around it. If our Sun had its own wobble as a result of the gravitational attraction of a massive companion object in a distant orbit around it, then we would notice it only through a change in the Sun's own position in space with respect to the stars in our cosmic neighbourhood. That relative motion in space, therefore, might account for the Sun's current direction of travel - towards the solar apex. So, if A/2017 U1 is an object from the outer solar system which has plunged rapidly down towards the Sun as a result of a slingshot encounter with the Dark Star (a sub-brown dwarf companion) located near to the solar apex, as Al suggests, then this would fit neatly into that broader scenario. In which case, we should be paying particular attention to that area of the sky if wishing to locate such a companion object. 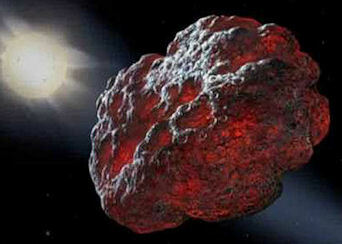 The red asteroid A/2017 U1 could turn out to be an emissary sent to light the way. Firstly, an encounter with a sub-brown dwarf among the comet clouds might have been sufficiently traumatic to drive off the object's volatiles before its later encounter with the Sun. Secondly, the object might have originated from the Dark Star system itself, in which case it would be asteroidal in nature by definition (being a member of the sub-brown dwarf's original family of planets/moons/asteroids). Thirdly, perhaps A/2017 U1 resulted from a deep space collision, the force and heat of which drove off the interior volatile ices, producing a fast-moving lump of rock. These all seem to be low probability events, but each one could explain the 'dead' nature of this incoming object. In the end, even though the behaviour of this interloper remains somewhat mysterious, it seems most likely that this object is 'just' an interstellar asteroid. I say 'just': It is, after all, the first ever comet to be designated as an asteroid, and, once confirmed, the first ever interstellar comet/asteroid to be observed. It's a brave politician indeed who stands up in front of the press and talks about ancient aliens. We're all proud of the heritage of our own countries, and why shouldn't the Iraqis be an6y different to the rest of us? After all, the first great civilisation, Sumer, crystallised out of pretty much nothing about 6000 years ago in the lands now known as Iraq, in the plain between the mighty Euphrates and Tigris rivers. Sumer introduced many of the features of modern civilisation we still benefit from today. Their early achievement included the development of cuneiform script, a mind-wrenchingly complex numerical system, the rule of law, a complex economy, medicine, architecture on a grand scale, urbanisation, and the first great creation epics and poems. They also worshipped a pantheon of gods, to whom they attributed their received knowledge. It has often been wondered how such a remarkable civilisation could have emerged so rapidly, as if from nothing. Now, it is recognised that earlier civilisations were around in the Levant, for example, the people who built Göbekli Tepe in Turkey, thousands of years before the emergence of Sumer in lower Mesopotamia. The cradle of civilisation may have already been in train elsewhere. Even so, the remarkable nature of the Sumerian society has caused some scholars to ponder whether the Sumerian myths might literally be true - that their knowledge was actually passed down by 'the gods'. This idea, which has been around for a very long time now, was publically discussed by the Iraqi Transport Minister, Kadhum Finjan Al-Hamami this time last year, on the occasion of the opening ceremony of a new airport in Nasiriyah, in the southern Iraqi province of Dhi Qar (1). He was speaking to an assembled group of reporters, and described how an airport had first been built on that very site 7000 years before. Kramer's many books about Sumer, mostly written in the 1950s and 1960s, were subsequently quoted by the maverick scholar Zecharia Sitchin, whose own writings from the mid-1970s onwards developed the ancient astronaut theme around the fabled 'Anunnaki' (7). 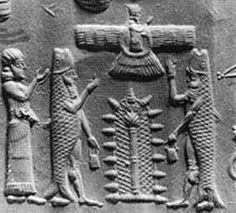 Sitchin argued that the Sumerian cosmology evident within their creation epics and clay tablet illustrations described the solar system as we now recognise it, but with an additional planet, which he identified as 'Nibiru-Marduk, after the Babylonian god. 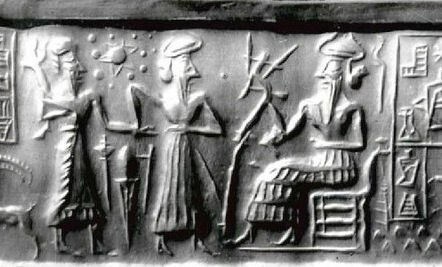 In this way, Sitchin argued that knowledge of even the planet Pluto lay within Sumerian scientific knowledge - a situation utterly impossible unless they had advanced technologies to rival our own, or had received knowledge of this small distant world from visiting ancient astronauts (the Anunnaki). It is this correlation which seems to have driven the Iraqi Transport Minister's remarks, rather than the more prosaic writings of Dr Samuel Kramer. Irrespective of this confusion, I personally find it remarkable that a public figure in the Middle East feels comfortable, indeed safe, to discuss his beliefs about ancient astronauts in this way. After all, the old polytheistic religions of Babylon, Assyria, Akkad and Sumer no longer sit easily alongside the overwhelming power of monotheistic Islam in Iraq. To be seen to take these myths seriously, to stand out publically in a Muslim country and speak of ancient technologies and space travel by the ancient Sumerians, is to invite great ridicule. Which makes me wonder whether Kadhum Finjan Al-Hamami's viewpoint is just the tip of the iceberg within the higher echelon of Iraqi society. His heresy may be more widely held than many imagine. It looks like it'll be another long, quiet autumn for Dr Mike Brown and Dr Konstantin Batygin on the summit of the Hawaiian dormant volcano Mauna Kea, searching for Planet Nine. They made use of the 8m Subaru telescope last year, and it looks like they were back again this year for a second role of the dice. I can only assume, given the time of the year, that the constellation of Orion remains high on their list of haystacks to search. Dr Brown has indicated that his team is narrowing down the search area through the use of countless computer simulations, but not much beyond that in terms of exactly where (1). Probably because he doesn't really know himself at this stage. More on their hopes for a breakthrough in a moment. 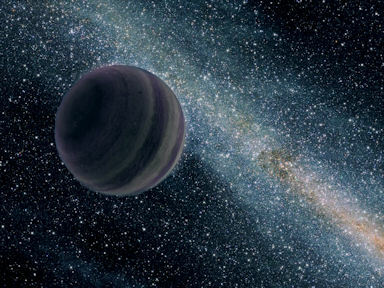 A recent article neatly sums up the current state of play with the hunt for Planet Nine (2), bringing together the various anomalies which, together, seem to indicate the presence of an undetected super-Earth some twenty times further away than Pluto (or thereabouts). Given how much, I've written about this materials already, it seems unnecessary to go over the same ground. I can only hope that this time, Dr Brown and his erstwhile colleague, Dr Batygin, strike lucky. They have their sceptical detractors, but the case they make for Planet Nine still seems pretty solid, even if the gloss has come off it a bit recently with the additional OSSOS extended scattered disk object discoveries (3). But there's nothing on Dr Brown's Twitterfeed to indicate what his plans are regarding a renewed search for Planet Nine. In which case, no need for the appearance of an external interloper. In return, I'd argue that the very difference between our system and others is exactly because of the interjection of an external interloper, radically shaking things up at the point of entry and for a considerable period of instability thereafter. In which case, no need for the rather Byzantine complexity of the Nice model. Anyway, back to Planet Nine. Alessandro Morbidelli has had more than a passing interest in Planet X for a very long time. I first wrote about his interest in the subject back in 2004, when the discovery of Sedna began to rock the astrophysics world (7). Dr Morbidelli and Harold Levison considered a number of scenarios which might explain Sedna's unbelievable orbit, including the passage of a brown dwarf through the early solar system, and the existence of an as-yet undiscovered massive planet beyond Neptune, among other ideas (8). 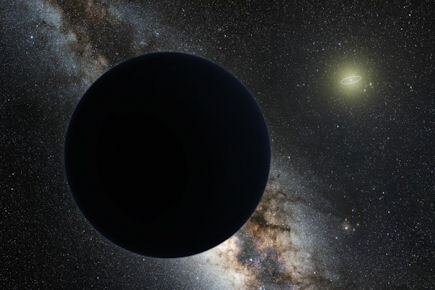 The computer simulations which were worked up from these hypotheses emerged around the same time as an article in a French magazine which interviewed the Italian astronomer from Nice, and included a diagram of the orbit of a possible Planet X (9) which could have been picked straight out of a book by Zecharia Sitchin. All of these points were looked at in Batygin and Brown's original Planet Nine paper (5), which attempted to model these observed effects using computer simulations. The general thrust of the answers provided in this new theoretical paper might be succinctly summed up by the Facebook status phrase "It's complicated...". Those are the kinds of relationships we're dealing with here. The word 'eerie' really didn't do it justice. On the 16th October, I was privileged to witness a rare meteorological phenomenon. Several hundreds of miles to the west of where I was, the dampening tropical storm that had been the Atlantic Hurricane Ophelia was battering Ireland. The hurricane had dragged up dusty air from the Sahara, and smoke from forest fires in Portugal, at it travelled towards the British Isles. These fluctuating, brooding clouds swept across the country, buffeted by the strong, dry winds. And within these ominous clouds, the sun turned red. 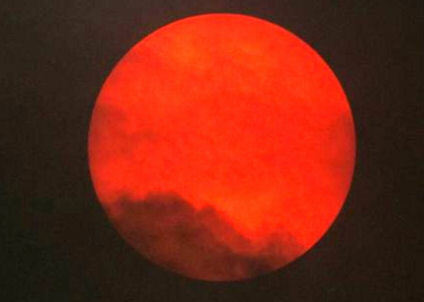 Some, naturally, associated the midday red sun phenomenon with Nibiru directly, sparking a rash of sensationalist articles in the UK tabloid press (2, 3). 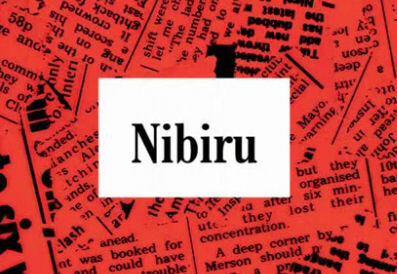 Such was the furore generated by these excitable hacks that Nibiru was subsequently mentioned on the BBC's satirical news quiz 'Have I got News For You?' (4). All good fun, of course, but these kind of omens do pack quite a bit of a psychological punch. With Brexit looming large here in the UK, and with the stability of the world sorely tested right now by brinkmanship across continents, one could be forgiven for pondering our collective futures. All we need now is the mother of all comets! 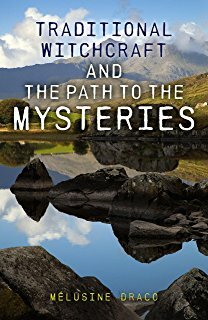 "It was Andy Lloyd Books Reviews that first put the Traditional Witchcraft series into its proper perspective." I clearly have an affinity with her material. Does this actually make me a witch, though? Friends of mine suggested trying the ducking stool test just to find out for sure. But since they're now all newts, I daresay my secret is safe for a while longer. Happy Hallowe'en!